The 12 Days of Giveaways is currently in full swing (12/9/18 – 12/20/18), and there are still several chances for you to win one of a handful of products from awesome industry partners we've teamed up with. We're about to mention another giveaway product that you can win. This time around, it's from none other than Newbold, which just happens to be a product I just had the pleasure of using for the first time just a few short weeks ago. Those fancy Newbold shoot through, polymer, reactive target plates that you can actually use indoors without threat of injury from ricochet. These are excellent training tools, and are definitely on my short list of stuff I need to buy. Why are they so cool? Well, for one, they are made from a polymer material, instead of your classic steel. This is good because if you've ever been hit by metal fragmenting at the range you know how much it can sting. I had a piece of metal plate so big heading for me once it was like slow motion and I actually had to duck to not get hit. Another thing, you can still get that instant gratification of knowing whether you hit your target or not because it's a reactive target. Reactive targets are a great way to train because you know you have a hit, even if you don't know where it is, plus they're great for training your mind how to engage more than one target. And since they pass through and are self-healing, you really don't have anything to worry about except for the lifespan, which is still in the neighborhood of 1,000 rounds of ammo. 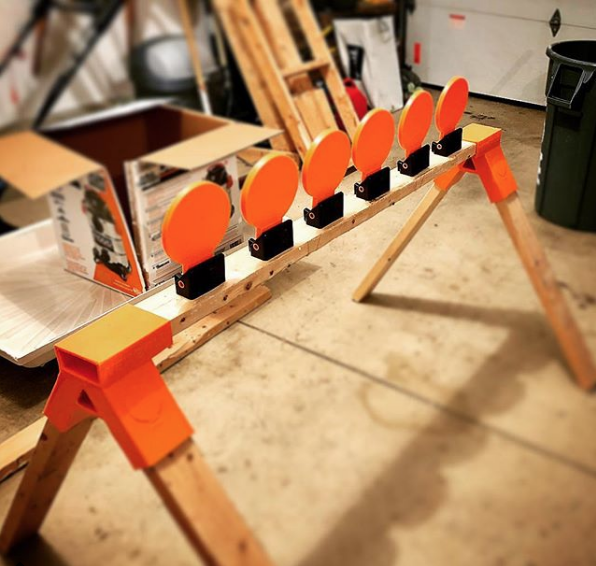 Matthew recently wrote up a review on these targets that you can find here. And, for more information you can find the Newbold Targets website here, that lists all of their polymer, pass through targets. Please make sure you enter this giveaway. It's simple and the odds of winning are pretty good. And, this is the first of the bigger giveaways that we have valued over $250. The rest of the giveaways stay over this number, value wise. Make sure you get in, download the app, and get your chance in to win this awesome prize from our good friends over at Newbold. You can find more info on the giveaways, at that link. Has a notification gone out today yet? I didn’t get one. It did go out. Thank you for letting us know. If you can please contact [email protected] and include the following: When did you download the app? What model phone do you have? Have you received any notifications from us in the past? Same here.. I didn’t get yesterday’s or today’s. Thank you for letting us know. If you can please contact [email protected] and include the following: When did you download the app? What model phone do you have? Have you received any notifications from us in the past? How do we know who won each day? I know they said the winner would be notified but a page with winners would be good. That’s an interesting idea. I’ll bring it up to the bossman to see what he says. Right now, we’re doing the drawings live on Facebook and then leaving those videos up for everyone to see. At the end of the campaign we will post a full list of all the winners. On a daily basis we are announcing winners on our Facebook page and then emailing/calling each winner. I have received and entered every contest but today it popped up on my phone and then immediately disappeared! None for me either. Email sent to [email protected]. I have been able to enter 2 days so far. When registering the form refuses to accept my email address. Jason, please make sure you don’t have a random space before or after your email address. It is not bogus and we have NEVER done a bogus contest. While a minority of people may be having some technical issues entering the contest they are the minority. About 1000 people a day have been entering. The prizes are being shipped to winners directly by each company that donated the product. The winners are being picked on LIVE video via Facebook live. There is nothing we could do to make this more transparent and I’m sorry if I come off as a little defensive but I think you would to if I suggested you were unethical or doing something dishonest. I encourage you to go to our Facebook page and review the daily videos where winners are being drawn. I saw the notification on my watch but could not open it. Since it showed up on my watch, it won’t show up on the phone. You should add the ability to view posted notifications within the App. Once the notification is gone, we can’t get it back. Found it on the app! Got it in!